In science, Darwin, Einstein and Newton; in music, Mozart and more recently, Prince Rogers Nelson; in painting, Picasso. 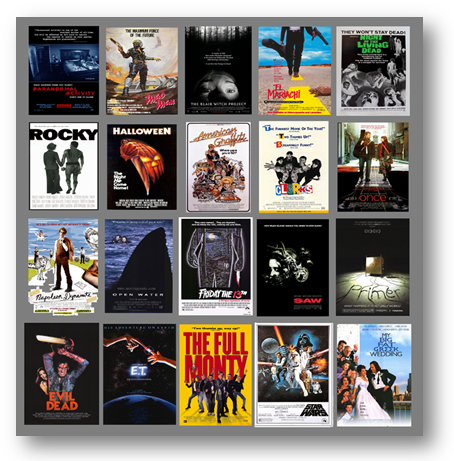 Stanley Kubrick was an eminent genius of cinema. Kubrick’s first (and, short!) movie, Day of the Fight (1951, 16 mins). For some, not much of a living. There are six thousand men like these in America – professional prizefighters. Only six hundred will make a living at all – and of these only sixty will make a good living. 99% of movie screenplays submitted to producers don’t get made. Also, 99% of past species on Earth have gone extinct. …Why does this “one in a hundred” number keep appearing? 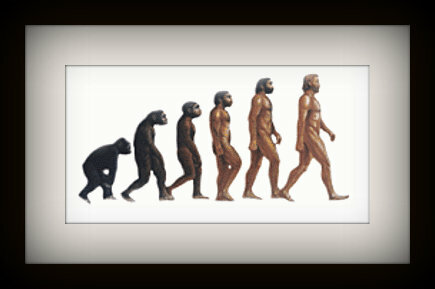 First let’s briefly talk about: Evolution. Likewise, in The Slaughterhouse of Literature, Moretti (2000) notes that only 99% of novels do not become canon. 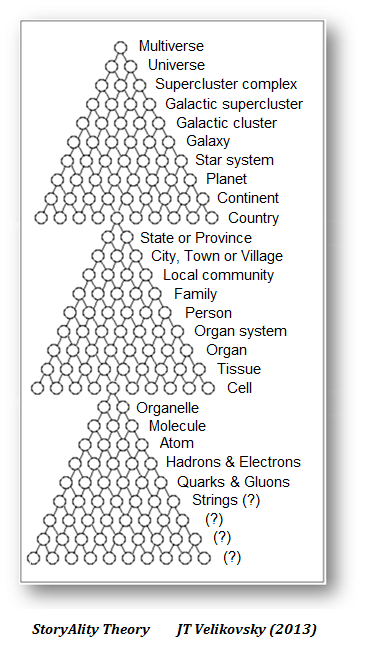 As a system, the `environment’ deselects about 99% of `units’ (systems) within it. About 1% are selected, and retained. I call it: The “Less-Than-1%” Problem. When we examine this problem closely, it has three parts to it. 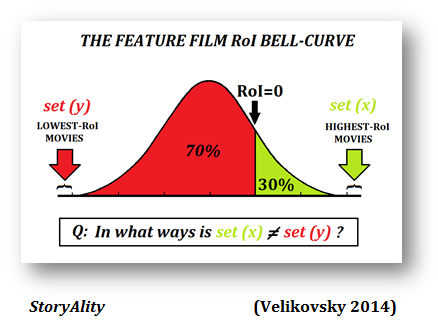 (3) This ultimately means that: There is a [.6 of 1% chance] of a screenplay `succeeding’ as a film, where “success” is defined as, a `break-even’ film…!!! So – the hard and unlovely truth is, 99% of screenwriters fail. Those are very bad odds. I also just want to note, this problem has existed since at least 1911 in the movie business. Let’s look at 3 examples. (1) Let’s take a look at an excerpt from the first Screenwriting Manual, The Photo-Play: A book of Valuable Information for Those Who Would Enter A Field of Unlimited Endeavour (by Ralph P Stoddard, 1911). `A Chicago film manufacturer reports that out of five thousand received as a result of an expensive advertising campaign, only fifty Scenarios were accepted. This one per cent, is probably a fair average of copy accepted and paid for by all of the manufacturers. `From the beginning, Hollywood was developing a story-gathering organisation and analysing the results generically, and soon began the systematic combing of the world story market. America was producing two thousand five hundred films a year by 1910, six thousand five hundred by 1915, and with the Western European powers crippled by war, `by 1917 the American industry was making nearly all the world’s motion pictures’. (3) Also – Macdonald (2004, 2013)* also shows, in his excellent research, that professional screen readers (e.g. 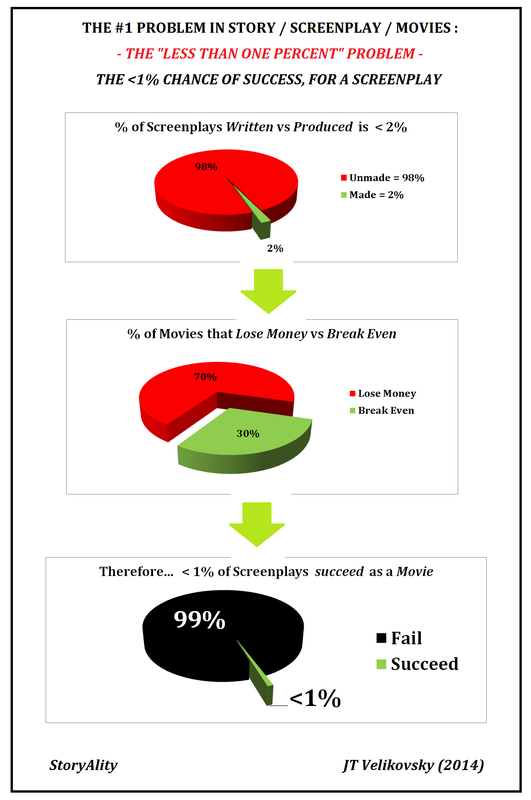 movie-story analysts) report that 99% of screenplays they assess, do not get made. So, the `Less-Than-One-Percent Problem’ in the domain of movies is a very-serious real-world problem. …You really want to be in the 1% who get their stuff (i.e. movie screenplays) MADE. Into: movies. Screenplays are written to be made into movies. Okay, so… What can be done about it-? What Are The <1% Of Screenplays That Succeed… Doing Right-? Whereas, StoryAlity Theory is a new scientific approach to examining success in: story, screenplay, film). Another key point is that: there is an ecology of the film system. It is a bio-cultural ecosystem. The Field of film is: a holon-parton and a holarchy. But – for example, a film story is also a holon-parton. And – it is a meme. (3) Look to command and control the holon-partons on the level below them. i.e…. Ever feel like you’re competing with other screenwriters..? Or – that your screenplay is competing with other screenplays? Note that – Culture (or, the `meme pool’, i.e. all the ideas, processes and products) is at both the top and bottom of this model… It is an iterative and recursive systems loop (see: Cybernetics). This is due to: the Systems model of Creativity (Csikszentmihalyi 1988, 1996, 2000, 2006), and Bourdieu’s practice theory of cultural production (1976, 1993). 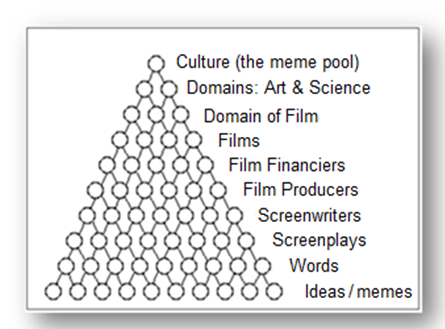 In the film industry (see the Film holarchy diagram above), as everyone knows – Screenplays compete (and sometimes, co-operate) with other screenplays – for attention, and for production finance. Screenwriters compete (and sometimes, co-operate) with other screenwriters. Producers compete (and sometimes, co-operate) with other Producers. This is: the evolutionary algorithm in action. It is both: Natural – and Artificial – Selection, in action. Anyway – 98% of screenplays also do not get made and basically, `die’ (…so, not exactly `extinct’, but a similar concept). But – as a screenwriter / screen storyteller – presumably – You want your movie story to reach the widest audience possible, and for the least film cost. But so – what is `the same all over’, is: the struggle for survival among movies – and especially, among screenplays. – This is all known as: a cost-benefit ratio, for artists and audiences. Q: So, What can be done to improve those odds, that your movie screenplay will become one of the <1% of movies that do break even? But, perhaps, see StoryAlity Theory; as a result of a study of the highest cost-benefit ratio films, it results in 30 `suggested guidelines’, for Screenwriters and / or Filmmakers. They may increase the probability of your story/screenplay/film becoming a super-viral movie… I really have no idea. – It’s really up to you. Also, maybe you have no talent – in which case, don’t blame me, if your movie bombs. Note: You do not have to adhere to all 30 of the StoryAlity Guidelines, if you prefer, but – the less you adhere to them all, the less viral characteristics your film will then share, with the top 20 most-viral films. The Story you tell in your film however, is: totally up to you. – It all comes down to Probability. That’s actually: How Evolution Works. (But – we silly old humans usually forget that. The reason for this, is called `ecological rationality’, and see Evolutionary Psychology for more on all that. – Basically, we have `inherited’ minds – that are designed in a certain way. 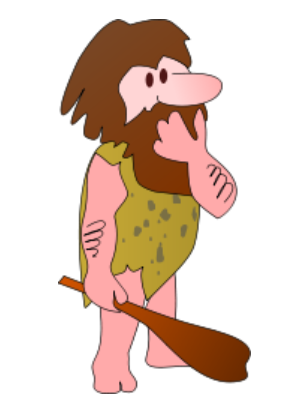 We basically: think much like a cave-person from the Pleistocene Era, or, what Tooby & Cosmides – and many others in the domain of Ev Psych – call, the EEA: the `Environment of Evolutionary Adaptedness’. And – also of course, anyone can use the StoryAlity system, in combination with any – and every – other `Screenplay System’ that they like. – It is not an exclusive Theory of Film Story; it can and does certainly `compete’ with other Screenplay Systems (if you choose to use it exclusively, but – that is your decision) – but – it is also more than happy to co-operate with them all, too-! But – as the great Sir Karl Popper often said, definitions of words are not important. Reality is. Thus: StoryAlity. In fact – words are very messy and even often totally ambiguous; Speaking as someone who has been a professional writer across almost-all media for over 20 years – words are in fact, a very clumsy, inaccurate, and badly-designed technology. Language is a very quick-and-dirty solution to the problem of social communication. 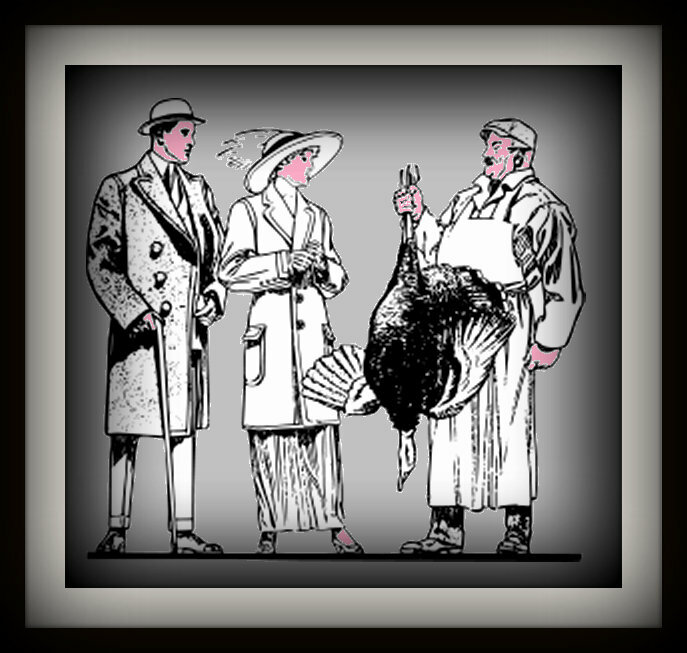 Then again – what do you expect? It was a technology invented by a bunch of dumb cavemen…! Cognition, and Language! Keeping everyone confused – and misunderstood – for over 100, 000 years! Both Biology and Culture evolve… Try and stop ’em. And, actually – if you are interested in Evolutionary Epistemology, you might even want to look at this survey, on “Schools of Thought, in the Arts / Humanities”! At any rate, so, that’s: The <1% Problem, in the Domain of Film. And – If anyone has any better ideas for solutions, then please do let me know! I would personally prefer that 100% of films were successful, 100% of the time. Seriously. I just don’t like seeing bad films. (It’s not a screenplay manual, but, it will teach you all about Creativity in Screenwriting and Film though). It’s amazing. Novrup Redvall, E (2012), ‘A systems view of film-making as a creative practice’, Northern Lights Yearbook of Film and Media Studies [Film and Media Production: Convergence, Creativity and Collaboration]. Vol. 10, no. 1, pp. 57-73. 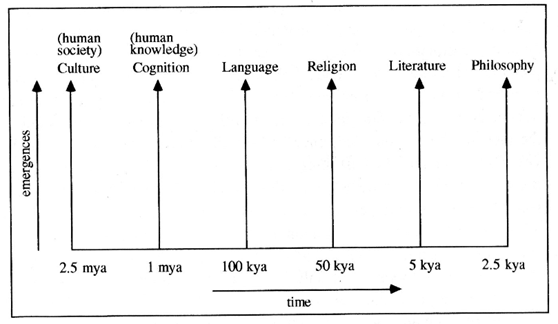 And – that’s about all the Evolution (i.e. Creativity) I can handle today. Primer (2002) Written, Directed, Starring, Sound & Music by: the cinematic genius, Shane Carruth. Made for $7,000, and, also one of the top 20 most viral films ever. You should watch it. About 30 x times. It actually gets better, every time. It’s like a Stanley Kubrick film, or something. [* – This figure, namely that 98% of screenplays presented to producers go unmade, comes from Dr Ian W. Macdonald’s excellent 2004 PhD dissertation, on screenwriting. 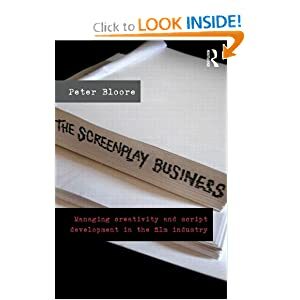 See also his excellent new (2013) book, Screenwriting Poetics and The Screen Idea.] In Screenwriting Poetics and the Screen Idea (Macdonald 2013) the figure is actually: 1% or less of screen ideas presented to producers are produced, rather than, 2% or less (from 2003, 2004), as, the earlier figure of 2% may be overestimated. Thanks for this StoryAlity post/tutorial… It’s very helpful for me! Can anyone spell: `Solving Problems’? Er – Wait, so you don’t think it’s a problem, that 1% of screenplays (as movies) succeed? And that 99% fail? I guess you don’t work in the industry, am I right? Or – maybe, you think that movies get made by magic? Complex problems require complex analysis. If you think the analysis of a problem (any problem) is over-analysis, good luck in solving problems, and in fact in absolutely everything. PS Your sarcasm is great. Or: not. I don’t think it solves any problems. In fact – you are actually part of the problem, as, with useless, content-free (and snarky) comments like yours, you certainly aren’t helping with the solution, of: The 1% problem, in movies.